This oil is ideal for very dry or sensitive skin, and especially recommended for sensitive and delicate epidermis. Sweet almond oil has calming properties and soothes irritations. Unctuous and soft, it also has soothing and emollient properties. Apaise rapidement les irritations et adoucit la peau. Je l'utilise aussi sur mes cheveux qui ont l'air un peu plus doux. Sweet almond oil can be used pure or mixed with other vegetable oils. It is ideal for use in diluting essential oils for body, face and hair care. This oil Sweet almond vegetable oil can be used pure on the face, body and hair. 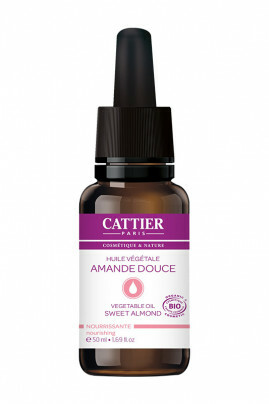 On the face, before your Cattier day or night care, use the sweet almond vegetable oil as a serum to moisturise, nourish and soothe all skin types and especially sensitive skins. On the body, to nourish the skin, apply the oil insisting on dry areas such as elbows and knees. For radiant and nourished hair, apply sweet almond vegetable oil before or after the shampoo to repair and protect the hair.